Think the world of fine watches is a men’s game? For years you would have been right and, while the number of pieces designed for men undoubtedly outweighs their female counterparts, the tide is slowly turning. Nowhere was this more evident than at Baselworld 2017 where, along with the fine jewellery timepieces usually aimed at female watch wearers, women’s diving watches and other highly complicated designs were out in force. Here’s our guide to the best new women’s watches for 2017. Limited to 555 of each colour, Chanel’s newest iteration of the iconic J12 watch features a stylised illustration of Mademoiselle Chanel on the dial with her arms acting as the hour and minute hands. Crafted in highly scratch resistant ceramic and steel, it’s waterproof to 200 metres making it the perfect timepiece for days on board. Despite the prevalence and popularity in men’s watchmaking, top world time watches are still few and far between for women so Patek Philippe’s new iteration of the 7130G will be warmly welcome by frequently flying females. 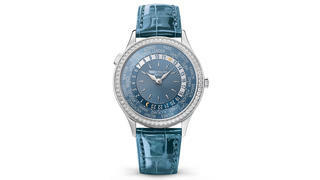 Previously only available in a muted brown shade, the latest edition comes with a peacock-blue dial showing all 24 time zones surrounded by a diamond set bezel and finished with a matching blue alligator strap. If you’re looking for an everyday watch that isn’t overly feminine or need a great ‘starter’ watch for a daughter or granddaughter, Tag Heuer’s freshly updated Carrera Lady is the perfect choice. Available with steel, rose gold or PVD coated cases and sunray, opaline or black dials, each one features a modular construction featuring nine separate parts meaning the possibilities for future customisation are almost endless. Thanks to its mastery of traditional Metiers d’Art craftsmanship, Jaquet Droz’s intricate timepieces have long been a favourite among female watch fans. 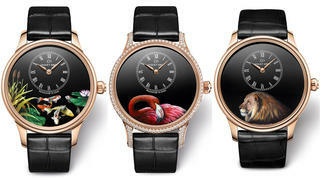 For 2017 the brand has introduced beautiful new Grand Feu black enamel versions of its popular Petite Heure Minute range, each hand-painted with miniature portraits of pink flamingos, lions or koi carp – symbolic animals from Africa, the Caribbean and Asia inspired by founder Pierre Jaquet-Droz’s love of travel. 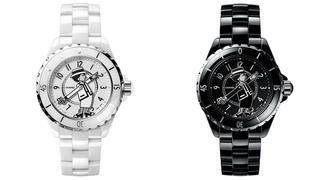 Prefer your watches big, bold and seriously complicated? 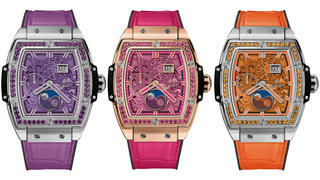 Hublot is the brand for you. Forget unassuming materials and dainty dials, Hublot’s Spirit of Big Bang Moonphase is offered in vibrant pink, purple, orange or blue with a 42mm tonneau case in King Gold or titanium and a moonphase complication on a dial finished with sapphires or amethysts. A true show stopper.